It’s dark earlier here. Much darker and sudden. It goes with that heart sinking realisation that a holiday is over. The sun touches down in Scotland at something like 21.10, here it’s half an hour earlier at least. How deflating. What would it be like to live up there in Scotland? I asked some locals during my camping trip where folks fit screens on their windows to keep the midges out. Their answer was “to be fair, there are not many time you can open your windows in Scotland”. Perhaps the late evening are compensation for the much darker winters. But so what, they have the mountains & glens. I’m still intoxicated by all of that. Is there any way I could do just a year up there to see whether I could do it. I have been hiking with Rosie in the Highlandsagain. There is a lifetime of holidays in those hills. Such holidays cost barely any more than living here- camping is costs about £5 per night and other needs would cost the same down here. I drove back on Friday thinking over what it is that is so beguiling. The bleak Rannoch Moor was thick with Scotch mist. Mountains I knew faintly loomed out of the mist, sometimes with skirts of lacy ragged clouds. There are few roads across that strange landscape- the A82 was straight, but distorted by harsh winters of ice and lengthy snow cover. Tall reflective posts marks the road’s edges- presumably sometimes it’s the only way to know where the road ends and the moor begins. I stopped a few times to take photos and take in the atmosphere. Soft drizzle penetrates clothes and camera. A few minutes pass and the midges gather, some to cloud around others to bite. They seems to prefer eyelids and neck. You have to move around to evade them, stand still and these slow flying insects catch up with you easily. As if the landscape is a conscious entity, it draws you in with a spell and wants to swallow you up. It was so hard to tear myself away on Friday. 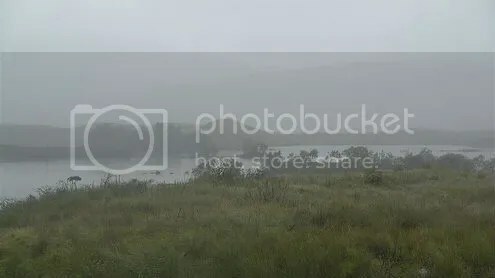 This entry was posted in Hiking, Travel, Weather and tagged camping, Fort William Scotland, Midge, Rannoch Moor, Scotland, Scottish Highlands. Bookmark the permalink.